From Aardman Studios, makers of CHICKEN RUN and the WALLACE AND GROMMET series, comes their latest claymation creation, SHAUN THE SHEEP. Having originally appeared in a WALLACE AND GROMMET short, the titular character spun off into his own children’s program, which in turn has now been made into a feature film. As in the show, Shaun is a mischievous sheep constantly leading his flock astray on ill-advised capers, much to the chagrin of the farmer who ostensibly “keeps” them, and his loyal sheepdog Bitzer. 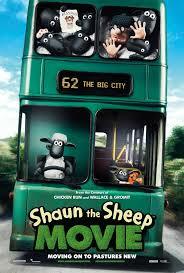 Shaun’s latest plot results in the farmer waking up in a big city hospital without his memory. He remembers how to sheer, though, and winds up becoming a much in demand hair stylist thanks to his skill with the clippers. Meanwhile Shaun and his fellow sheep, and of course Bitzer, bravely venture into uncharted urban territory to try and get their farmer back. A particularly determined animal control officer makes this even more difficult than it already would have been. The film is completely free of dialogue, the human characters uttering gibberish about on a par with the adults in “Charlie Brown” cartoons. You won’t miss it. The story is simple and straight forward enough that no words are needed, and the absence of dialogue allows the film to put its focus on slapstick and clever sight gags. It’s not quite as sophisticated as CHICKEN RUN or the WALLACE films, but the film’s good natured, silly humor is spot on for the target audience of kids. Fans of classic silent era comedy and/or Jaques Tati should be pleased as well. 3 out of 4 stars. A dialogue-free, non-digitally designed, plain old stop-motion animated film that is hilarious beyond human measure.